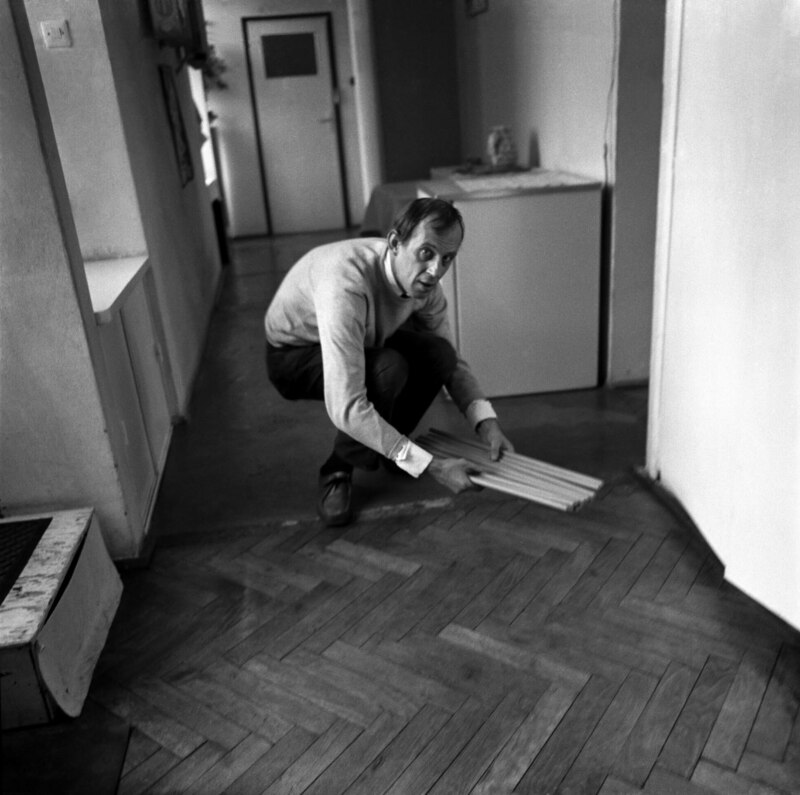 Edward Krasiński lived and worked from 1970 until his death in 2004, on the top floor of a socialist tower block on Solidarity Avenue/Aleja Solidarności, Warsaw. Krasiński first moved in as the lodger and friend of Henryk Stażewski, a leading figure in the Polish Avant-Garde movement, who had been given the expansive space by the increasingly culturally progressive communist state in 1962. Following Stażewski’s death in 1988, his works and belongings were removed, except for the dangling picture wires and shadows where works had once hung, leaving 120 square metres in which Krasiński began to make and install his own work. 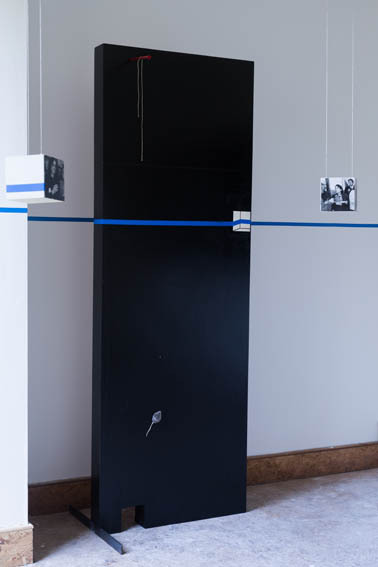 Much of Krasiński’s work after this time, was made in response to the history of the apartment and its previous owner with one of the most notable features being the blue taped line, stuck by Krasiński horizontally at the height of 130cm, ‘everywhere and on everything’. ‘I don’t know whether this is art’, he commented, ‘but it’s certainly scotch blue, width 19mm, length unknown’. 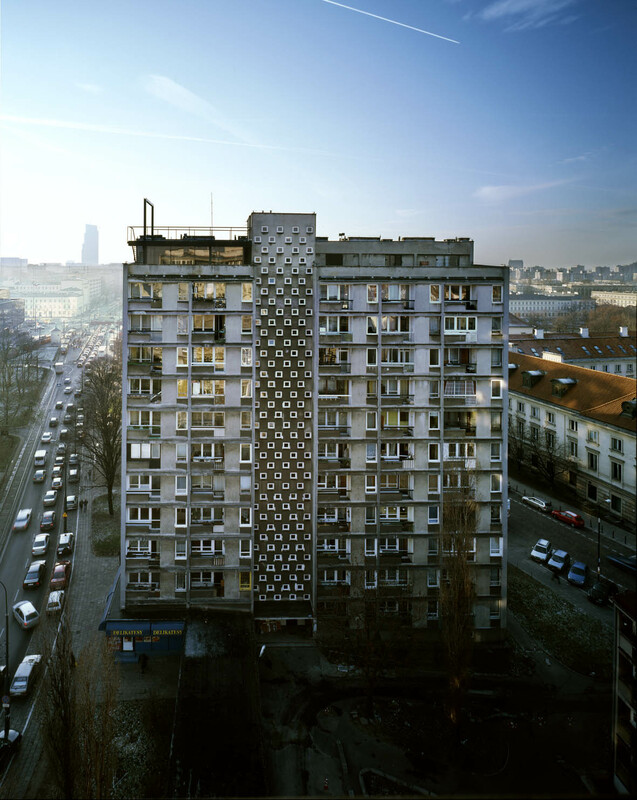 Described by Krasiński’s mentor and landlord, Stażewski, “the blue stripe is the intervention by the artist who is an on-looker/witness of the events taking place. It is an observer of changing phenomena that contain time. All that exists is time. Even inanimate objects are not extemporal: they are mutable”. The line, which had marked Krasiński’s work and everything surrounding it from c.1969, demonstrates a spatio-temporal dynamism that this exhibition brings into dialogue with Latham’s own time-based theories. Latham too determined that an artist had the capacity to “observe”, reflecting and reaching insights through intuition and therefore understood the fundamentally temporal dimension of all objects and phenomena. Lena Kiessler and Joanna Mytkowska (eds. ), Edward Krasiński: Interwencja, Warsaw 2001. Edward Krasiński (1925-2004) studied at the Kunstgewerbeschule in Cracow during the war, then at the Cracow Academy of Fine Arts. In the 1950s, he moved to Warsaw. 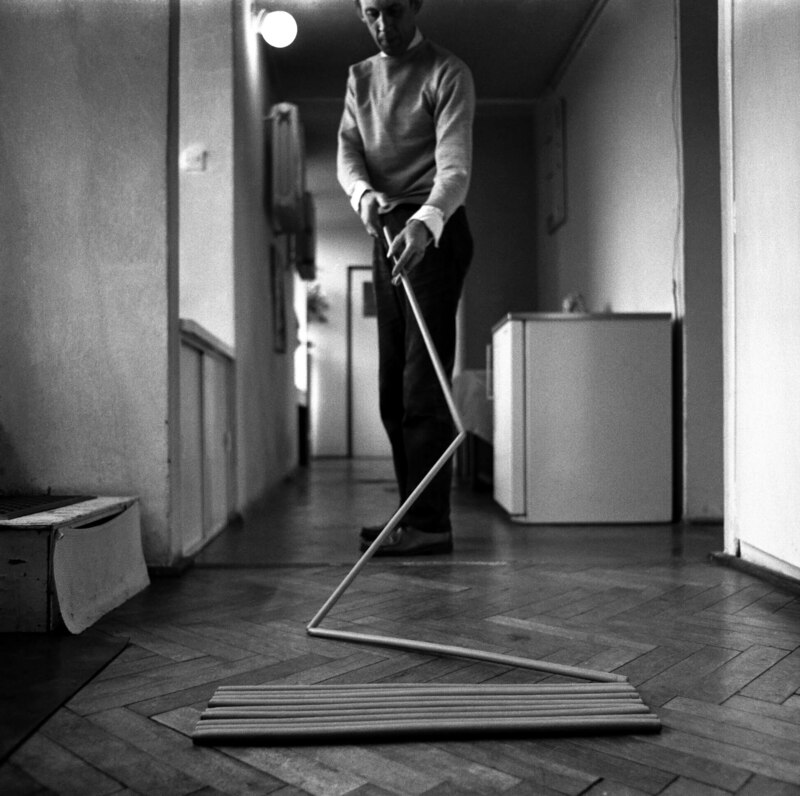 He debuted in the early 1960s with shows at Warsaw’s Krzywe Koło Gallery and Cracow’s Krzysztofory Gallery, presenting his Objects in Space and sculptures that were minimalistic in their form. In 1966, with Anka Ptaszkowska, Wiesław Borowski, Mariusz Tchorek and Henryk Stażewski, he co-founded the Foksal Gallery. From 1969, he started working with blue Scotch tape, which he used for the first time in the courtyard of the Musée d’Art Moderne de la Ville de Paris during the 3éme Salon International de Galeries Pilotes. His works were exhibited as part of the Guggenheim International Exhibition. Sculpture from Twenty Nations (1966) and the Tokyo Biennale: Between Man and Matter (1970) as well as in solo shows at the Kunsthalle Basel (1996), the Zachęta in Warsaw (1997) and the Generali Foundation in Vienna (2006). The Avant-Garde Institute/ Instytut Awangardy was founded in 2004 by the Foksal Gallery Foundation and opened for the public in 2007. Its main purpose is to preserve Edward Krasiński’s studio and make it available to the public. 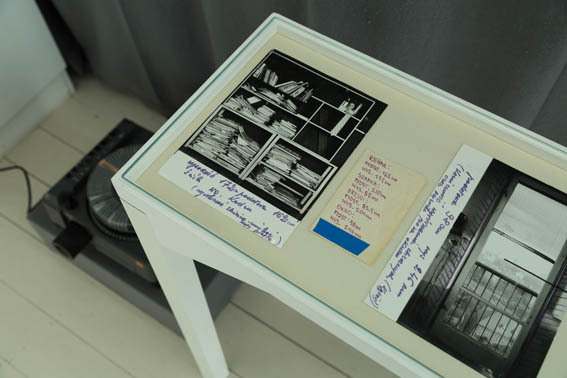 In the apartment/studio that Krasiński inherited from Henryk Stażewski, a pioneer of avant-garde art in Poland, has been preserved a unique collection of works arranged by the artist in the years 1988–2002. The installation remains unchanged since Krasiński’s death in 2004. It is not only the themes explored in the works of the two artists which are uncannily parallel, despite never having met – they both problematised the binary of public/private in their own homes. Krasiński (and Stażewski before him) and Latham’s doors were always open to artists, intellectuals, students and their homes became hubs of activity and learning. 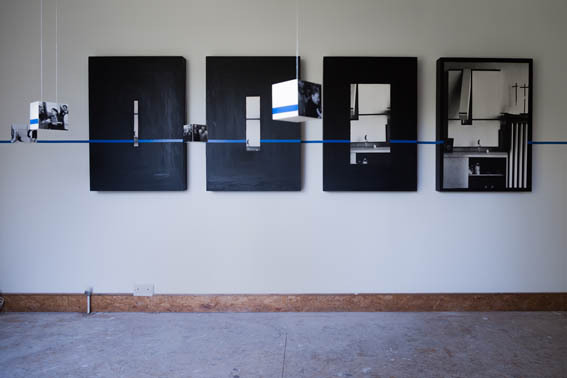 By using the blue tape to line his apartment walls, Krasiński conceptually enclosed his life within his art practice, breaking the distinction between living and working. His home was a destination in Warsaw and on one visit, Daniel Buren contributed to the apartment’s growing installation by marking the windows with his own signature stripes. Latham’s Peckham home had been a semi-public space since his arrival to the former DIY shop in the late 1980s. In 2003 Latham declared it a living sculpture, naming it Flat Time House after his theory of time. He designated anthropomorphic attributes to each area of the house (The Face, The Mind, The Brain, The Body Event and The Hand), as a spatial division of labour with each body part corresponding with the activity that took place there. In The Mind, Latham installed a collection of his own works as educational apparatus that visually communicated his Time Base Theory that the visitor (and himself) could contemplate and understand intuitively. 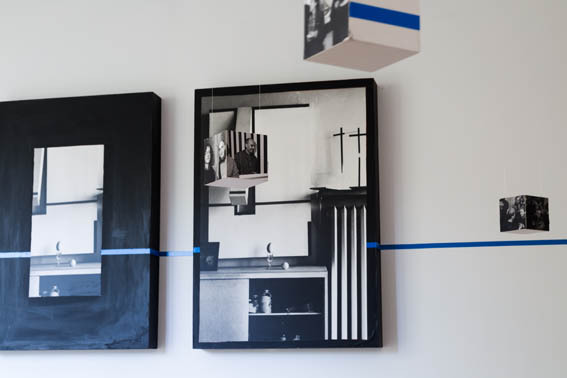 In the exhibition, Solidarity Avenue, Krasiński’s blue line cuts through both Latham and his own works as well as the house’s contents; furthering the claim for the house as a total, dynamic and living artwork. Following Krasiński and Latham’s deaths in 2004 and 2006 respectively, their families faced deciding the fate of the artists’ homes/studios/artworks. With the generosity of Krasiński’s daughter Paulina Krasińska, the Foksal Gallery Foundation founded the Avant-Garde Institute (Instytut Awangardy) on Solidarity Avenue/Aleja Solidarności. Its main purpose is to preserve Krasiński’s studio and make it available to the public and has done so, leaving the contents of the studio-installation untouched, to deteriorate over time. The Foksal Gallery Foundation has built a glass enclosure on the spacious penthouse terrace where contemporary exhibitions, lectures, workshops and academic sessions, form a broad context for the tradition created by Stażewski and Krasiński. In 2008, following refurbishment, the Flat Time House Trust was formed and the house re-opened as FTHo Institute; a gallery, archive and residency space with temporary exhibitions events and an alternative education programme. Although the ambitions and physical spaces of the Avant-Garde Institute and FTHo differ, the connections between the artists who lived within their walls and their institutional motivations are clear. As FTHo closure approaches (FTHo is to permanently close in July 2016), we reflect on our institution, its history and relevance in contemporary art discourse. 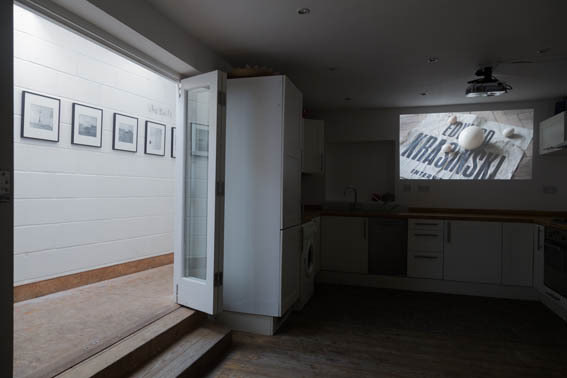 By exhibiting the work of artists – such as Krasiński – who shared with Latham a similar use of space, artistic preoccupation with time and institutionalised legacy, we can represent the complexity and potential within the artist’s home and studio.